A soffritto is a mixture of chopped vegetables (typically onion, carrot and celery) which have been slowly sautéed in olive oil to become the foundation of many Italian recipes. The lightly browned vegetables add flavour and richness to the tomato Passata. Passata can be used as a base for pasta sauces, lasagne dishes, soups and stews. Soffritto is a mixture of chopped vegetables (typically onion, carrot and celery) which have been slowly sautéed in olive oil to become the foundation of many Italian recipes. 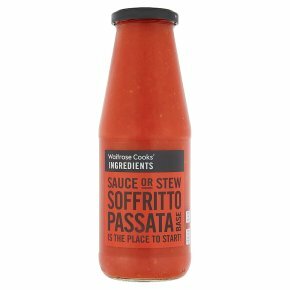 The lightly browned vegetables add flavour and richness to the tomato Passata, the Passata can be used as a base for pasta sauces, lasagne dishes, soups and stews.